Would you like to see a recap of the latest pot and bedding plant introductions presented at the FlowerTrials? Maybe you were unable to visit this event or could not see all the locations you had planned for? 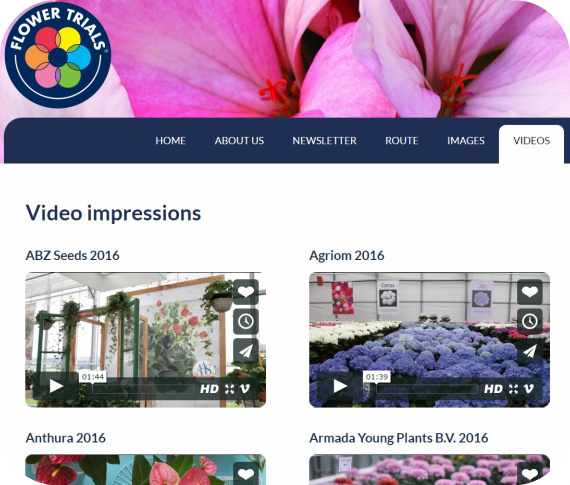 Videos are available from following companies: ABZ Seeds, Agriom, Anthura, Armada Young Plants, Beekenkamp, Benary, Bock Bio Science, Brandkamp, Cohen, Danziger, DHM, Dümmen Orange, Elsner PAC, Evanthia, Floranova, Florensis, Florist, Gediflora, Endisch, Hassinger Orchideeën, Hilverda Kooij, Hishtil, Jaldety, Jonge Planten Grünewald, Kientzler, KP Holland, Lily Looks, Moerheim Young Plant, Morel Diffusion, PanAmerican & Kieft Seed , Royal Van Zanten, Sakata, Schneider, Schoneveld, Selecta one, Sion, Syngenta FloriPro Services, Takii, Van den Bos Flowerbulbs, Volmary, VWS Export and Westhoff. Next year, the FlowerTrials will take place as usual in week 24 i.e. from Tuesday 13 to Friday 16 June 2017 with breeders in the Westland and Aalsmeer region (NL) and Rheinland Westfalen (GE) opening their doors to show the latest innovations and assortment to growers, buyers and trade partners from all over the world.